There’s one thing that could mean the end of the Dawn mission: if the hydrazine fuel for its maneuvering thruster system runs out. Now, engineers for the Dawn mission have figured out a way to save on this fuel while still sending Dawn to a new science orbit around the dwarf planet Ceres. They are effectively extending the mission while expanding on the science Dawn can do. 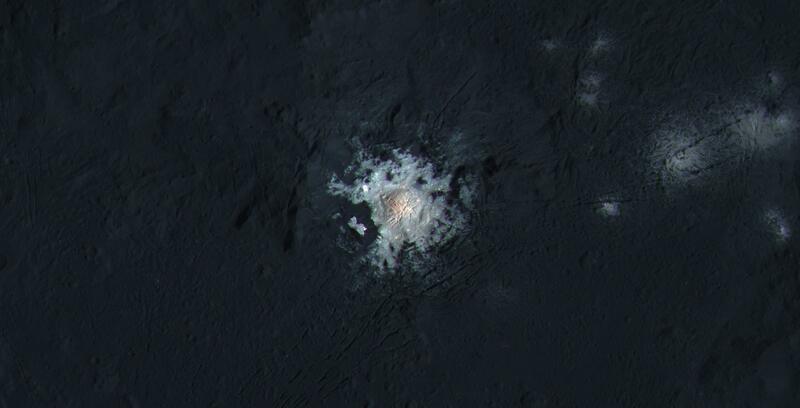 And in the meantime, Dawn’s cameras can take stunning new images, like the one above of Occator Crater on Ceres and its intriguing, mysterious bright regions. “This image captures the wonder of soaring above this fascinating, unique world that Dawn is the first to explore,” said Marc Rayman, Dawn’s chief engineer and mission director at the Jet Propulsion Laboratory. Dawn started making its way to a sixth science orbit earlier this month, raising its orbital height to over 4,500 miles (7,200 kilometers) from Ceres. For previous changes in its orbit, Dawn needed to make several changes in direction while it spiraled either higher or lower. But Dawn’s ever-ingenious engineers have figured out a way for the spacecraft to arrive at this next orbit while the ion engine thrusts in the same direction that Dawn is already going. This uses less hydrazine and xenon fuel than Dawn’s normal spiral maneuvers. Previously, Dawn’s engineers have done things nothing short of miraculous, such as figuring out how to operate the spacecraft with only two reaction wheels (when at least three are needed, normally), they have developed new, emergency flight paths on short notice, and they keep figuring out ways to conserve the hydrazine. Earlier in the mission, they analyzed more than 50 different options to figure out how to reduce their fuel usage by a whopping 65 percent. Occator Crater, with its central bright region and other reflective areas, provides evidence of recent geologic activity. The latest research suggests that the bright material in this crater is comprised of salts left behind after a briny liquid emerged from below, froze and then sublimated, meaning it turned from ice into vapor. Another new image from Dawn scientists at the German Aerospace Center in Berlin shows how the dwarf planet’s colors would appear to the human eye. The color was calculated based on the way Ceres reflects different wavelengths of light. Dawn scientists say that one goal of Dawn’s sixth science orbit is to refine previously collected measurements. The spacecraft’s gamma ray and neutron spectrometer, which has been investigating the composition of Ceres’ surface, will characterize the radiation from cosmic rays unrelated to Ceres. 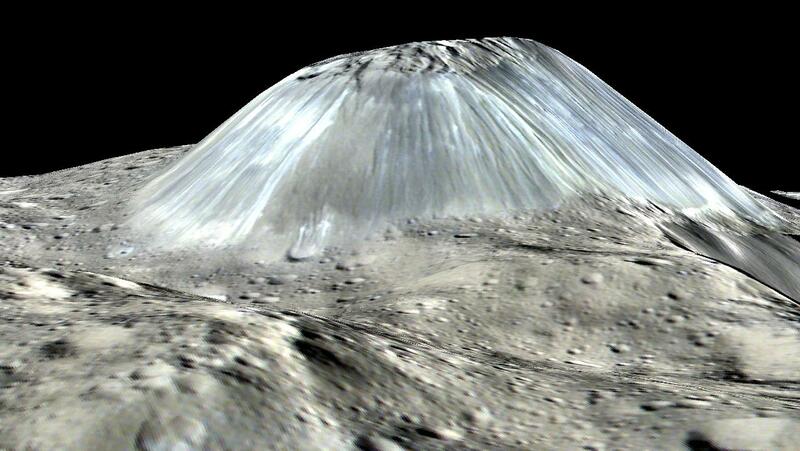 This will allow scientists to subtract “noise” from measurements of Ceres, making the information more precise. The spacecraft has gathered tens of thousands of images and other information from Ceres since arriving in orbit on March 6, 2015. After spending more than eight months studying Ceres at an altitude of about 240 miles (385 kilometers), closer than the International Space Station is to Earth, Dawn headed for a higher vantage point in August. Then, in October, Dawn raised its orbit to about 920-mile (1,480 km) altitude, returning more images and other valuable data about Ceres. Thanks to the ingenuity of Dawn’s engineers, we’ll have more time to study Ceres. See all of Dawn’s latest images here.